Available in rugged cases and designed for mobility, the new CNet routers are applicable to a host of mobile situations. CMR-982 is now available at CNet distribution including SED, Ma Labs, CT Int'l, Intcomex and CMR-983 will be available soon. 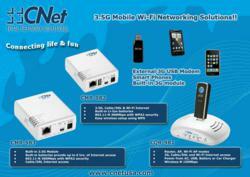 Shop CNet 3G Wi-Fi Routers for LE$$ / Price list Click here!